I will get this out of the way early and then not mention it again...the referee for the USA vs. Slovenia game was awful. He missed key plays and called back the goal that would have sent the USA to victory. Nothing he did was good...as evidenced by FIFA's (supposed) forthcoming grade of a "poor performance" and relief of all further World Cup center refereeing duties. He was horrible, and cost us the win...for the most part. That still does not excuse the USA from giving up two "soft" goals. How many times have we given up a cheap goal in the first 15 minutes of a match?? It cannot continue. We came very close to losing this match because of our ineptitude on defense. What gives, USA? What gives? Rather than go over the game and pick apart what worked and what didn't, I will just give a few suggestions as to what needs to change and happen for the next game against Algeria, a virtual "must win" scenario. We control our fate...we win and we're through. Bench Gooch and put in Clarence Goodson. Gooch is still not consistent enough to start. Sure, he had a stellar match against Eng;land. But his performance was forgettable and hurt us against Slovenia. If he isn't going to dominate, then give Goodson that opportunity. Goodson impressed and was extremely reliable and consistent in the lead up to South Africa. 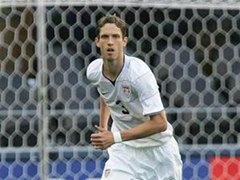 He performed admirably last summer in the Confederations Cup, and I cannot remember when he last made a huge mistake on the field for the USA. Give the kid the start. Findley is suspended (accumulation of yellow cards), so start Herculez!! He has, obviously, been a hard training ground player as evidenced by Bradley's continued support and playing time. Now give him more than just a few minutes at his native position (he was often seen at center back against Slovenia). Let him run up top with Altidore. Herculez most resembles the speedy and daring Charlie Davies...the perfect strike partner for Altidore. Let this pairing take off and see how many goals are scored. Let's get at it Wednesday, Boys!! You have more fans back here in the States!! Everyone is watching and paying attention, now!! Get out there and show the world that we can take care of business and shock the world!! Another awesome post James. I really want the US to make it through and repeat what happened last year at the confederations cup. Would love to see them take down a big European power.